Diamond Select Toys brings to life one of the biggest moments in Spider-Man lore - the unmasking of the web-slinger at the hands of his greatest foe! Straight from the cover of Amazing Spider-Man #39 comes the next Marvel Select action figure, The Green Goblin! 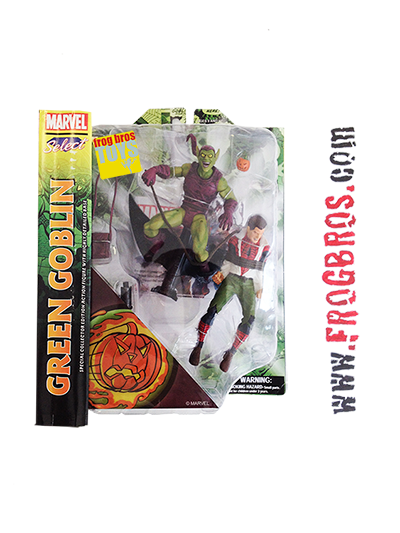 Featuring 12 points of articulation, the Green Goblin includes a detachable pumpkin bomb and bomb satchel, Goblin Glider with stand, and a Peter Parker/Spider-Man victim accessory figure.